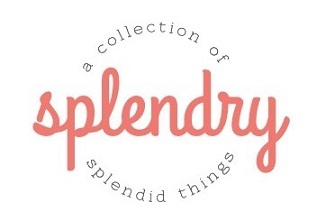 This post contains affiliate links meaning purchases made through included links may result in Splendry earning a small commission, at no cost to you. 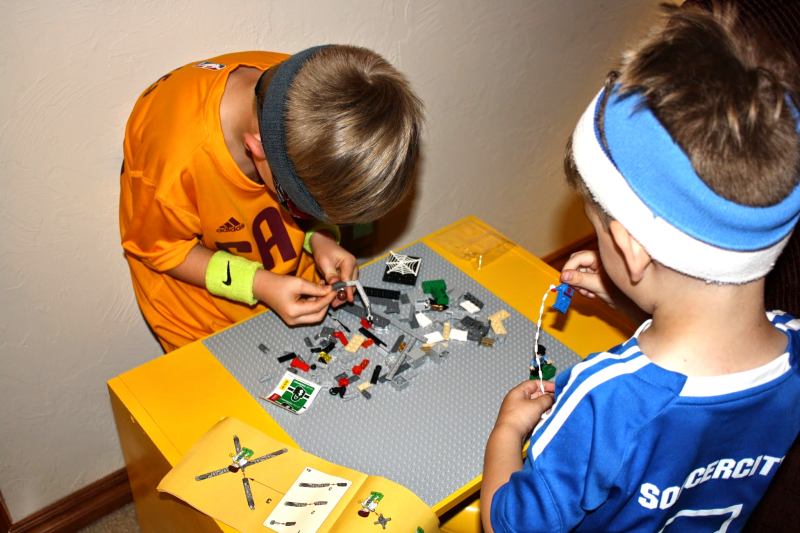 With two young boys at my house – (and one adult boy) – we have already accumulated a vast collection of LEGOs. I was desperately needing something to organize and contain the chaos that also gave the boys room to play freely. Plus, those little suckers HURT when they are sneakily hiding in your shag carpet. 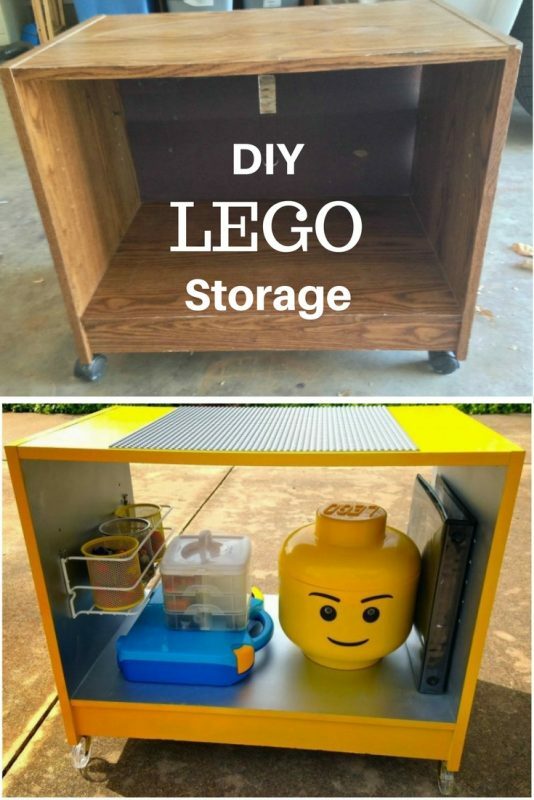 The need for LEGO storage is real. Their birthdays were coming up, so I decided I would make them a LEGO storage and play table. I went to a local thrift store looking for something not too large, but high enough they can stand or sit while playing, and also with wheels – or where wheels could easily be added – for transport from room-to room. I found this lovely, old TV stand for $2.00. Yes, please! My main goal was to use as many things as I could that I already had, and with a quick turn around. Key quick element to always have on-hand: spray paint. Therefore, CHEAP! First I removed the cardboard backing and old castors. Next, I quickly gave a coat of spray primer. I let that dry completely, which takes about 2 hours on particle board. I wanted a two toned look for more interest, so, next I taped paper bags around the outside and sprayed the inside with KRYLON Silver metallic. Plus, I already had the paint. I carefully took off the paper on the outside and carefully retaped it over the silver inside with painters tape. We already had this yellow VALSPAR Gloss Gold Abundance paint/primer spray paint from a previous project from the boys’ rooms, which was perfect since it would match their rooms. I let this dry for an entire day so that I would be very sure it was dry (gloss finish takes longer to dry). Then I did a second coat and let dry for another whole day. Perfect! I used ELMER’S spray glue to secure this 15×15 LEGO plate to the top of the table. (If you do not already have the LEGO plate, this will easily be your most expensive part of the project. Those things can be pricey!) I found clear and brass castors at ACE HARDWARE for $5.00 for 4. We had an office binder not being used so I added some clear sleeves that I already had, and made a place for all of the instruction booklets for their LEGO sets. I organized little accessory pieces and extras in a plastic sorter that I already had from a couple years back from the Target $1 Spot. I used picture hanging hooks to secure this pantry organizer, that wasn’t being used, to hold these cute yellow and silver cup sorters from Target $1 Spot that I bought last year and had never used. They fit perfectly! I was annoyingly excited about this little detail. I used each cup for pieces of the LEGO people: heads, hats & hair; bodies, legs, accessories; completed people. They can remove the cups from the shelf, as needed, but it keeps them sorted so they know where to look for each piece. So here is the whole thing put together. We had the blue box and LEGO head already, and those have building pieces sorted by color. This is making the building much easier! 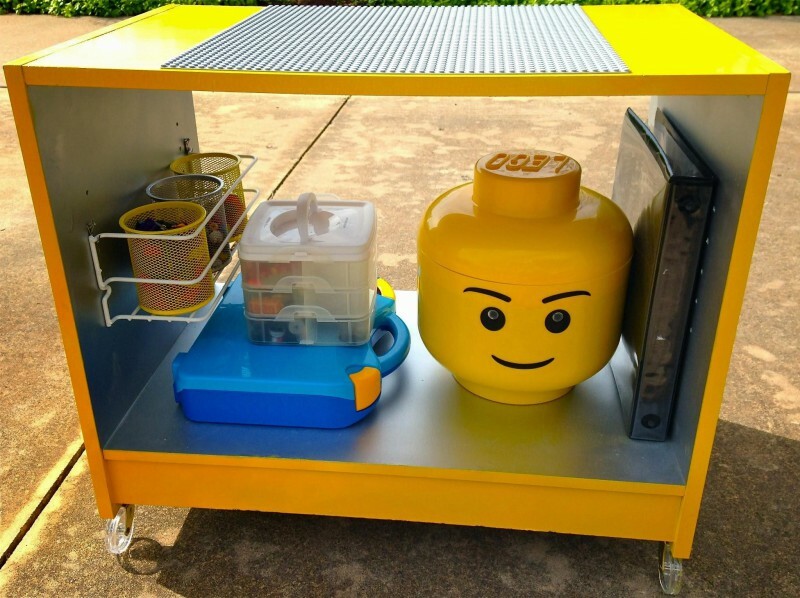 This LEGO storage project cost a total of $7.50 in new purchases. So great! Here they are after getting the table at their birthday party. Success! !